At the Homework Club in Thousand Oaks, a sunny 11-year-old named Gio is working out the pronunciation of “Socrates” on his social studies vocabulary list. Gio has been coming to these sessions for four years and keeps showing up because his grades keep going up. On this January afternoon, a dozen children as young as 6 sit at tables in the low-slung community room of the Los Arboles Apartments just down the road from Cal Lutheran’s main campus. A sign on the wall advertises the program’s “carrot cake and stick” approach to rewarding pupils. They receive their snack only after finishing homework and an hour’s reading. For 16 years, the Area Housing Authority of Ventura County has teamed up with Cal Lutheran to match undergrads with first- through eighth-graders who live at low-income housing complexes run by the public agency in Thousand Oaks, Moorpark and Camarillo. Through personalized after-school sessions, students help the children successfully complete homework, hone study skills and learn the steps that lead to college admission. About 10 Cal Lu undergrads work with approximately 85 kids each semester in the joint effort, which won the 2010 Partnership Innovation Award of Excellence from the National Association of Housing Officials. Tutoring is free to the kids; the college students get paid through the federal work-study program. Tutors are not much older than the kids. On the day I visited, 18-year-old freshmen Stella Bautista and Hector Rodriguez were in charge. Gio sat a few feet away with his vocabulary sheet. “Instead of doing my homework alone, I know I have the right answer. And I can do it with friends,” says the sixth-grader, who wants to be a lawyer or an actor when he grows up. The Homework Club gives children support unavailable to them at home. “Some parents don’t have the knowledge and can feel lost and confused,” said Bautista, a psychology and criminal justice major from Hollywood. The way Rodriguez sees it, the program bridges divides in schools. “Kids struggle with going to the teacher for help. It isn’t always the easier option. Here the environment is calm, and that helps them improve their grades,” he said. Rodriguez is the first in his family to attend college. “I was shocked when I was accepted to CLU. It was magical,” said the music major. The biggest challenge he faces as a tutor is the wide range of ages. “It takes time to figure out what each individual’s needs might be,” he said. Rodriguez grew up in the San Fernando Valley and informally helped his high school classmates with their studies. Experience as a tutor has helped Gonzalez, who graduated with a degree in marketing communication, to serve in his current post as a property manager at the Housing Authority of the City of San Buenaventura. “The tutoring brought to light the fact each person has their own story. Things go smoother when you treat everyone as an individual,” he said. 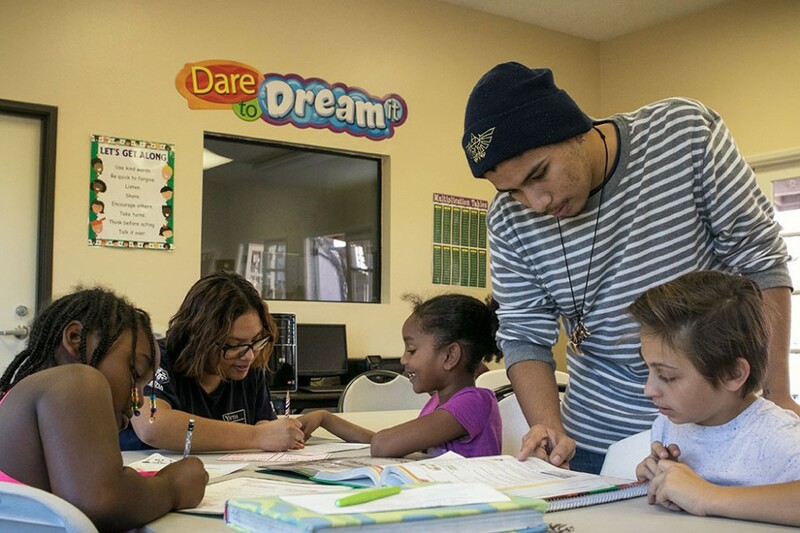 So critical is the participation of Cal Lutheran students, the Homework Club runs on the university’s academic calendar, said Alejandra Toledo ’14, a former tutor who now coordinates the program as a housing authority employee. “Without them, there would be no program,” added her colleague Anna Diaz. For 12-year-old Jackie, one-on-one attention from college students helps her stay on top of studies. “They help me with questions on my homework and then make sure I understand every answer,” said Jackie, who plans to go to college to become a vet, a doctor or a soccer star.